Hand'Solo Records » Blog Archive » Going Out For Business Sale! Home Bass > Going Out For Business Sale! Ha ha! As a sometime grammar and spelling Nazi, those signs that read “Going Out For Business” on stores around Toronto have always kind of bugged me, so hopefully using it now relieves the tic! 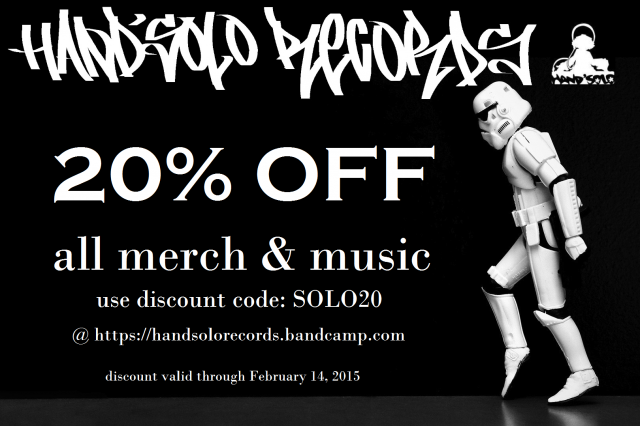 Hand’Solo Records has big plans for 2015 with lots of releases lined up to drop over the next few months, so help me make room in the warehouse (re: my apartment) for new CDs by taking advantage of this 20% discount on all Hand’Solo merchandise and music at Bandcamp. It also includes all digital albums for those who like less physical clutter around the house, unlike my own living arrangements. If you or a friend has been thinking about picking something up from the label, now is the time! 20% off until February 14, 2015. Spread the word!